1. Super-bright LED never need replacing. 2. Always ready to use. 3. Generate power anywhere anytime without power source. 4. Revolutionary self-powered technology never needs battery replacement. 5. Recharge over and over simply by winding the crank. 6. 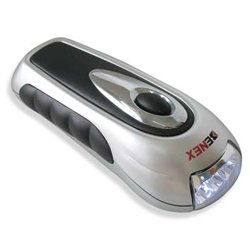 Great for power outages,emergencies,camping and more. 1. Rechargeable LIR2032 Lithium battery: 3.6V, 35mAh. 2. In normal status, rotate 160 cycles / minute, the battery capacity can reach 80%. 3. 1 LED burns ≥30 min., 3 LEDs burn ≥20 min. 4. In proper use, lithium battery can be recharged ≥500 times.